Cool My Camper portable air conditioning units run on a 220-240v mains supply. The unit only uses 450 watts when cooling, that’s only 1.88 Amps on 230 volts. This compares favourably with large roof mounted units that can consume 1500 watts with a current draw of 6.5 amps. 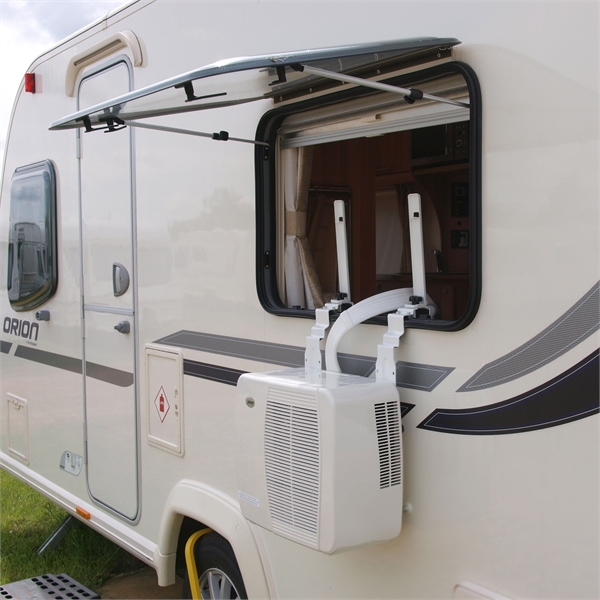 The mounting brackets can be fastened onto standard windows without limiting the function of the window itself however, while the unit is in operation, the windows should remain closed. Note: the two units are permanently connected, they cannot be disconnected for installation or for storage. The fan unit has a LCD display to control the unit. There are two fan speeds and four levels of cooling together with a timer that switches the unit off in periods of time from 30 minutes and seven and a half hours. The unit is thermostatically controlled, when the cooling function reaches the desired temperature, it switches onto a lower setting to save energy. As you can see the unit has thumb screws to ensure the unit is vibration free on the outside of the caravan or motorhome. Both units (which are connected) can be comfortably stowed away underneath larger benches or fixed beds. Suitable for spaces of 16 cubic metres. Tests were undertaken in an insulated space of 11 cubic metres typically the volume of a 5 or 6 metre van taking account of furniture. The temperature was 30ºC with 80% relative humidity. 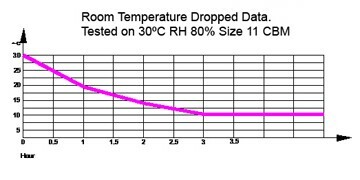 In the test the unit quickly reduced the temperature by a third to 20ºC. This is what we would call a pleasant temperature. However we allowed the units to continue operating at full output and a final temperature of 10ºC was obtained – much colder than you would desire but it just proved the cooling capacity of the units. These test conditions are very different from a poorly insulated caravan or motorhome parked in full sun. In these circumstances any air conditioning unit is going to have a battle as heat from the sun (through solar gain) may be putting the equivalent of four 3Kw heaters into your accommodation. In these circumstances the unit brings welcome cooling at low level to a space where you can take shelter. In larger accommodation this may cool the lounge area only but it will reduce the temperature and humidty throughout the van. 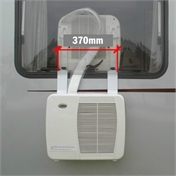 The unit will provide cooling air for caravans and motorhomes but you have to be realistic in your expectations. 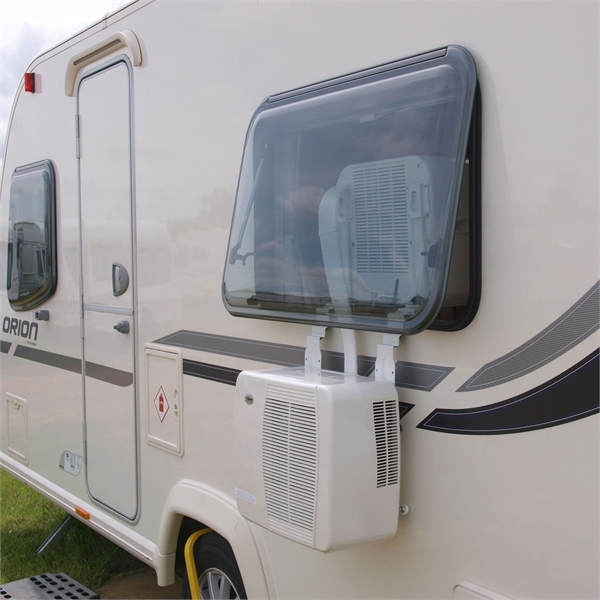 The unit runs on a 3 amp hook-up, is portable and transportable and a fraction of the cost of a 3.2Kw roof mounted a/c unit so they will not match the performance of one! 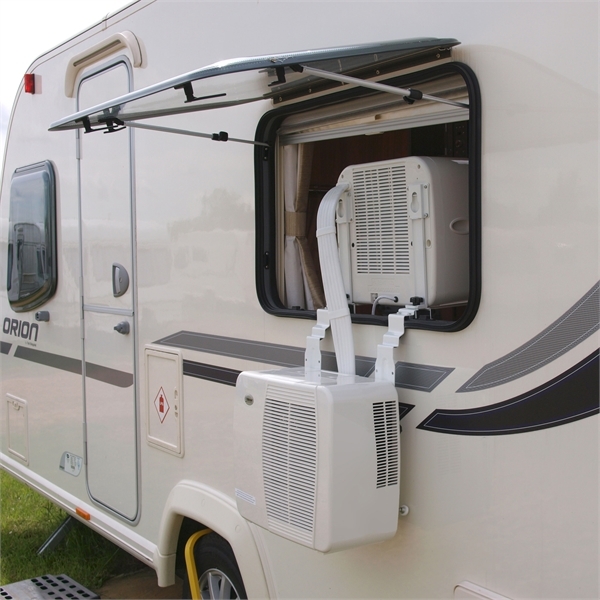 Cool My Camper units provide comfort cooling during the day and make it easier to sleep at night in hot, humid environments. The unit is not noisy and our customers confirm that it is a lot quieter than any roof mounted equipment. High speed RPM: 1,250, = 45.8dB. Low speed RPM: 600, =48dB. Power flex measurement unit to plug approx 2 metres. Brackets are adjustable to suit many motorhome and caravan windows. A diagram showing dimensions can be found here. The horizontal spacing is fixed at 370mm. Please measure your windows to check the unit will fit without interfering with latches on the bottom of your window.